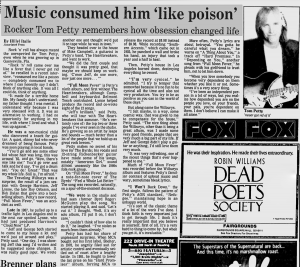 Rock 'n' roll has always meant the unexpected for Tom Petty, even when he was growing up in Gainesville, Fla.
"Rock 'n' roll came over me like a fever that I never got rid of," he recalled in a recent interview, "consumed me like a poison -- completely consumed me to where I can honestly say I didn't think of anything else. It was all I could do, think or anything. "It made for a terrible home life. My family didn't understand; my father thought I was mental. I understand why because I was very obsessed with it. It was an alternative to working. I had no opportunity for anything in my life, with where I lived and what I was up against." He was a non-musical child who discovered a knack for guitar. A quiet, skinny kid who never dreamed of being famous. Petty was soon playing in local bands. "You'd go and see some other kid whose hair was long, this was around '65, and go, 'Wow, there's one like me!' You'd go over and talk and he'd say, 'I've got a drum set.' 'You do! Great!' That was my whole life. Still is, I'm afraid." The Traveling Wilburys was a surprise, the result of a jam session with George Harrison, Jeff Lynne, the late Roy Orbison, and Bob Dylan that grew into a best-selling album. 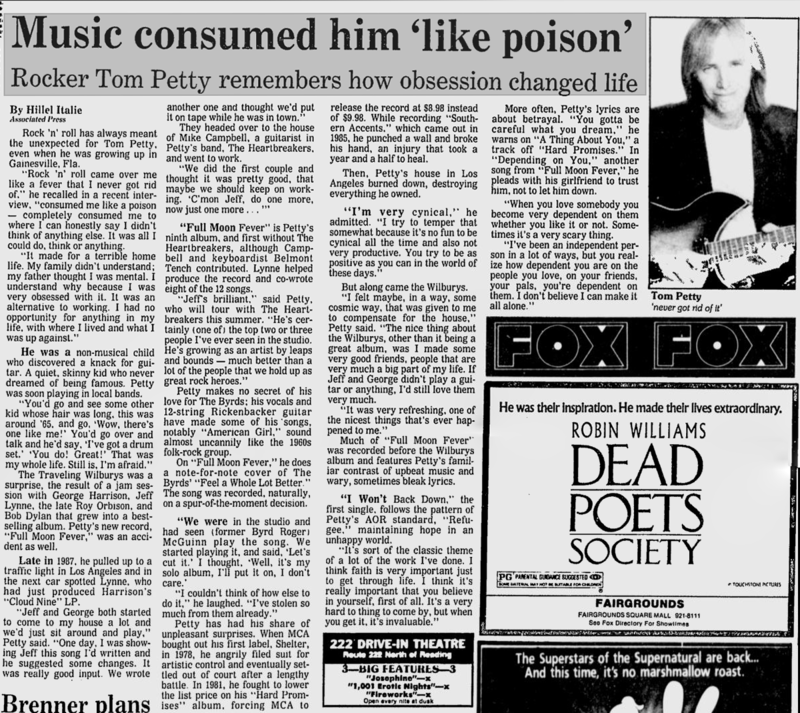 Petty's new record, "Full Moon Fever," was an accident as well. Late in 1987, he pulled up to a traffic light in Los Angeles and in the next car spotted Lynne, who had just produced Harrison's "Cloud Nine" LP. "Jeff and George both started to come to my house a lot and we'd just sit around and play," Petty said. "One day, I was showing Jeff this song I'd written and he suggested some changes. It was really good input. We wrote another one and thought we'd put it on tape while he was in town." They headed over to the house of Mike Campbell, a guitarist in Petty's band, The Heartbreakers, and went to work. "We did the first couple and thought it was pretty good, that maybe we should keep on working. 'C'mon Jeff, do one more, now just one more...'"
"Full Moon Fever" is Petty's ninth album, and first without The Heartbreakers, although Campbell and keyboardist Belmont Tench contributed. Lynne helped produce the record and co-wrote eight of the 12 songs. "Jeff's brilliant," said Petty, who will tour with The Heartbreakers this summer. "He's certainly (one of) the top two or three people I've ever seen in the studio. He's growing as an artist by leaps and bounds -- much better than a lot of the people that we hold up as great rock heroes." Petty makes no secret of his love for The Byrds; his vocals and 12-string Rickenbacker guitar have made some of his songs, notably "American Girl," sound almost uncannily like the 1960s folk-rock group. On "Full Moon Fever," he does a note-for-note cover of The Byrds' "Feel a Whole Lot Better." The song was recorded, naturally, on a spur-of-the-moment decision. "We were in the studio and had seen (former Byrd Roger) McGuinn play the song. We started playing it, and said, 'Let's cut it.' I thought, 'Well, it's my solo album, I'll put it on, I don't care. "I couldn't think of how else to do it," he laughed. "I've stolen so much from them already." Petty has had his share of unpleasant surprises. When MCA bought out his first label, Shelter, in 1978, he angrily filed suit for artistic control and eventually settled out of court after a lengthy battle. In 1981, he fought to lower the list price on his "Hard Promises" album, forcing MCA to release the record ar $8.98 instead of $9.98. While recording "Southern Accents," which came out in 1985, he punched a wall and broke his hand, an injury that took a year and a half to heal. Then, Petty's house in Los Angeles burned down, destroying everything he owned. "I'm very cynical," he admitted. "I try to temper that somewhat because it's no fun to be cynical all the time and also not very productive. You try to be as positive as you can in the world of these days." But along came the Wilburys. "I felt maybe, in a way, some cosmic way, that was given to me to compensate for the house," Petty said. "The nice thing about the Wilburys, other than it being a great album, was I made some very good friends, people that are very much a big part of my life. If Jeff and George didn't play a guitar or anything, I'd still love them very much. "It was very refreshing, one of the nicest things that's ever happened to me." Much of "Full Moon Fever" was recorded before the Wilburys album and features Petty's familiar contrast of upbeat music and wary, sometimes bleak lyrics. "I Won't Back Down," the first single, follows the pattern of Petty's AOR standard, "Refugee," maintaining hope in an unhappy world. "It's sort of the classic theme of a lot of the work I've done. I think faith is very important just to get through life. I think it's really important that you believe in yourself, first of all. It's a very hard thing to come by, but when you get it, it's invaluable." More often, Petty's lyrics are about betrayal. "You gotta be careful what you dream," he warns on "A Thing About You," a track off "Hard Promises." In "Depending On You," another song from "Full Moon Fever," he pleads with his girlfriend to trust him, not to let him down. "When you love somebody you become very dependent on them whether you like it or not. Sometimes it's a very scary thing. "I've been an independent person in a lot of ways, but you realize how dependent you are on the people you love, on your friends, your pals, you're dependent on them. I don't believe I can make it all alone."